The Brady District has blossomed into a foodie’s paradise. No matter what you’re craving, you’re probably in luck. Laffa Medi-Eastern Restaurant and Bar is definitely one of the most unique and interesting finds there. Chef Miranda Kaiser, aka Honey Badger, combines the best of Mediterranean and Middle Eastern cuisines to create a one of a kind, addictively delicious dining experience for Tulsans. Since she opened in March of this year, business has been good, she reports. “I wanted to introduce Tulsa to this food slowly. I didn’t want to scare anyone,” says the feisty, very talented, petite chef from Wales. She said the falafel and shawarma window opened a couple of weeks before the restaurant. Not terribly familiar with either, I got a quick lesson on each. Falafel are those little fried balls made from chickpeas and parsley that can be eaten in a pita or by themselves with a variety of dipping sauces and condiments, including curried tehina, mango chili sauce, lemony-avocado dressing, tzadiki sauce, pickled slaw, avocado, sumac onions, Israeli chopped salad, hummus, pickles, pickled beets, sweet potato fries. The word, “shawarma” refers to the spices that are used, rather than then way the meat is prepared. It is cooked on a spit and then shredded, combined with harissa and served in a wheat wrap with a choice of the above sauces. Although I didn’t try the shawarma the day I was there, I definitely will on my next trip. I did indulge a little. Besides the delicious falafel, I tried the Peasant’s Plate, which is a cheese plate that is almost too pretty to eat – but it was even more delicious. 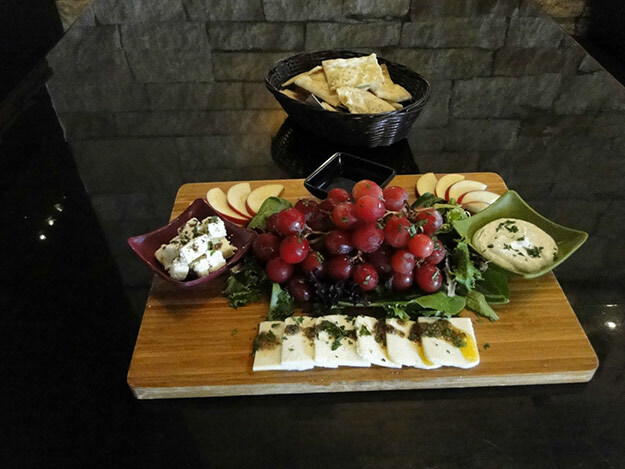 Apple slices and large, red grapes accompanied the array of fantastic cheeses like feta, marinated in lemon, sumac and za’atar. There was also a creamy goat cheese spread and a special farmer’s cheese that was topped with olive and sun-dried tomato tapenade. Although I was there on Food Truck Wednesday, I was definitively too full to partake in any of that goodness. That will be for another day (and review). 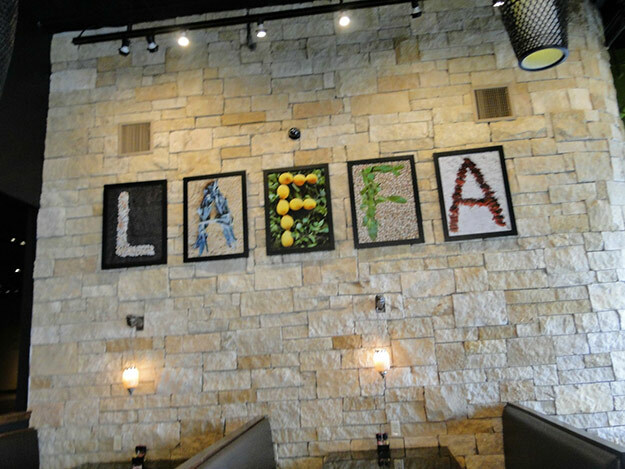 Of course, I can’t eat at Laffa without mentioning the wonderful Laffa bread that they make fresh every day. 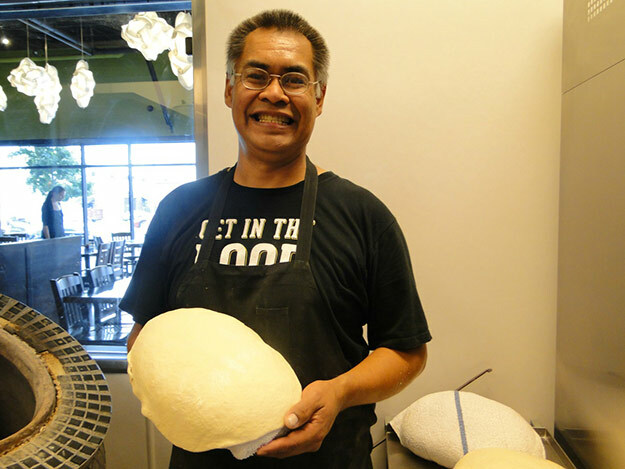 One of the highlights of my visit was watching the bread being made. Her employee, John, expertly showed me how it was done. 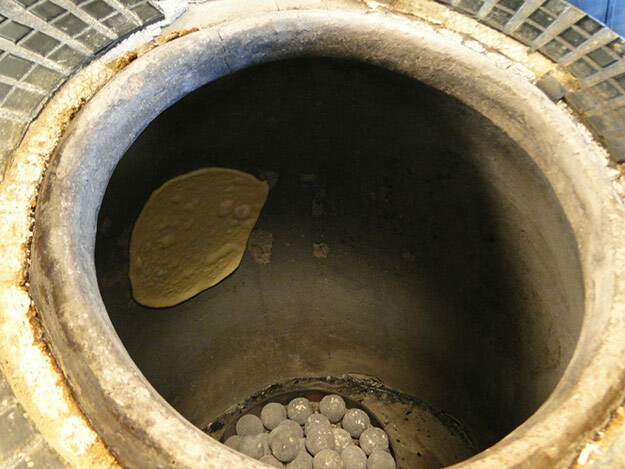 A large, almost drum shaped oven, called a tanoor, was preheated to 500 degrees and John literally slapped the dough up against the inside wall of the oven until it was slightly puffed up and a little crisp on one side. He then used long sticks to get the bread out of the oven. It’s great eaten by itself or with any of the delicious sauces and mezze. Speaking of the mezze, there are 12 from which to choose. All are so delicious, it’s truly a hard choice. 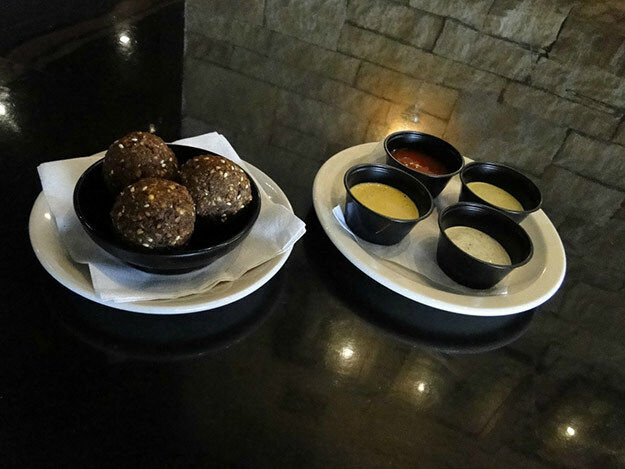 You can choose between a Full Medley ($14.99) with six mezze or a Half Medley ($9.99) with three. 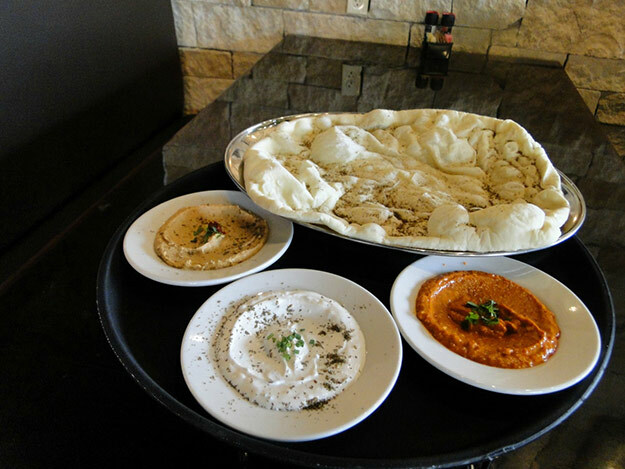 The choices include a wonderfully different black-eyed pea hummus, a creamy yogurt dip called Anatolian Labneh, made with za’atar, garlic, watercress & freshly chopped mint, and Matbucha, which is a cooked Turkish salad with sautéed eggplant in a slightly spicy tomato, onion and red pepper sauce. Although I was way too full to even think about dessert, the dessert menu looks very interesting as does the cocktail menu. I was particularly intrigued by the Chocolate Apricot Flourless Torte ($6.49) and the Middle East Panna Cotta ($5.99), but I will save those for later visits. I just love food! I love everything about it! I adore the satisfaction I get from preparing a wonderful meal for those I love. I love the way all of those fabulous aromas waft through the whole house and beckon all to come to the kitchen to see what’s cooking. Cooking is an act of love. It is an intimate way to share part of yourself with someone else. A good meal can tear down walls and mend relationships better than years of therapy! I truly believe this. I am a foodie and freelance writer who lives in Broken Arrow, OK with my hubby, our daughter and some furry family members. I love spending time in the kitchen developing recipes and scouring cookbooks for new inspiration. 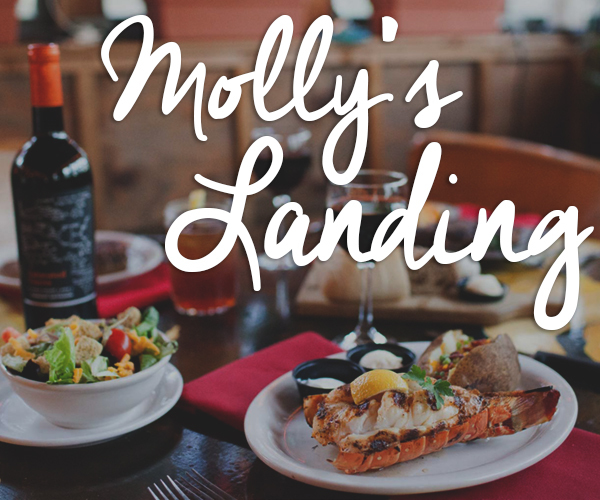 Formerly a preschool teacher and part-time food writer, I have recently jumped into the writing as my career of choice. I love sharing my knowledge of food and cooking. Besides writing food related articles for Tulsafood.com, Oklahoma Magazine and Examiner.com, I have also been known to teach a cooking class or two for kids of all ages – from the very young to the young at heart. If you have cooking questions or want a particular recipe, please email me at jill1208@cox.net. Now wash your hands, put on apron and let’s get in the kitchen!